COMMENTS:        This trigger occurred at longitude,latitude = 17.91,-20.37 [deg]. Dec(J2000) = +50d 31' 13"
with an uncertainty of 3 arcmin (radius, 90% containment, including systematic uncertainty). The BAT light curve showed a FRED structure with a duration of about 10 sec. The peak count rate was ~3000 counts/sec (15-350 keV), at ~2 sec after the trigger. Dec(J2000) = +50d 29' 39.5"
with an uncertainty of 3.6 arcseconds (radius, 90% containment). This location is 109 arcseconds from the BAT onboard position, within the BAT error circle. This position may be improved as more data are received; the latest position is available at http://www.swift.ac.uk/sper. A power-law fit to a spectrum formed from promptly downlinked event data gives a column density consistent with the Galactic value of 2.53 x 10^21 cm^-2 (Willingale et al. 2013). with a 90%-confidence error radius of about 1.10 arc sec. This position is 5.7 arc sec. from the center of the XRT error circle. The estimated magnitude is 18.05. No correction has been made for the expected extinction corresponding to E(B-V) of 0.19. In comparison with early reported photometry (LaPorte et al., GCN 20885) the OT is faded, and we confirm the afterglow of the GRB 170317A. Dec (J2000): +50d 29' 35.0"
L. P. Xin, T. M. Zhang, J. Y. Wei, Y. L. Qiu, J. S. Deng,=20 J. Wang, X. H. Han=EF=BC=8CC. Wu and E. W. Liang reports: =20 We began to observe GRB 170317A (LaPorte et al., GCN 20885) =20 with Xinglong 0.8-m TNT telescope at 2017-03-17,11:39:17 (UT),=20 about 1.9 hours after the Swift trigger time.=20 =20 The optical afterglow reported ( LaPorte et al., GCN 20885;=20 Mazaeva et al., GCN 20886) was clearly detected in the=20 stacked 11*300 sec R-band image. =20 Preliminary analysis shows that the brightness of the optical afterglow in R band is about 19.8+/-0.1 mag, calibrated by nearby USNO B1.0 objects at the mid time of 2.3 hours after the burst. This message could be cited. We observed the field of GRB 170317A (LaPorte et al., GCN 20885) with the 2.4-meter optical telescope at Gao-Mei-Gu (GMG) station of Yunnan Observatories. Observations began from 13:58:18 UT, about 4.2 hours after the trigger. We detected the afterglow with R~19.96+/-0.10 mag, calibrated by a nearby USNO-B1.0 star. 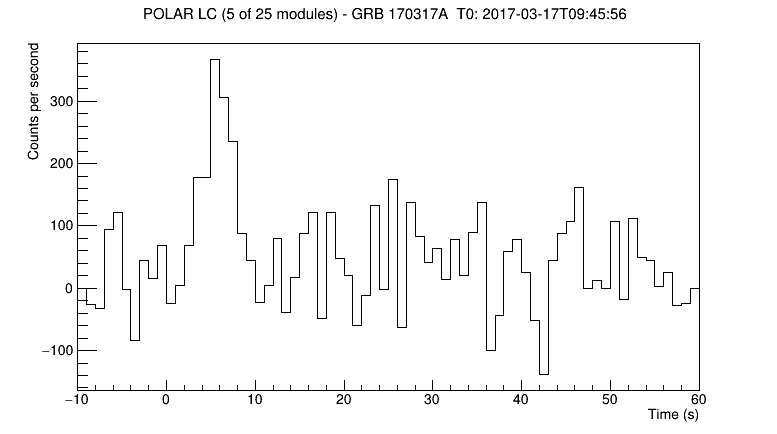 We have analysed 6.9 ks of XRT data for GRB 170317A, from 68 s to 13.5 ks after the BAT trigger. The data comprise 8 s in Windowed Timing (WT) mode (taken while Swift was slewing), with the remainder in Photon Counting (PC) mode. The light curve can be modelled with a series of power-law decays. The initial decay index is alpha=3.8 (+4.2, -1.4). At T+105 s the decay flattens to an alpha of 0.58 (+0.07, -0.09) before breaking again at T+3006 s to a final decay with index alpha=1.4 (+0.4, -0.3). A spectrum formed from the PC mode data can be fitted with an absorbed power-law with a photon spectral index of 2.05 (+0.10, -0.07). The best-fitting absorption column is consistent with the Galactic value of 2.5 x 10^21 cm^-2 (Willingale et al. 2013). The counts to observed (unabsorbed) 0.3-10 keV flux conversion factor deduced from this spectrum is 3.5 x 10^-11 (5.1 x 10^-11) erg cm^-2 count^-1. If the light curve continues to decay with a power-law decay index of 1.4, the count rate at T+24 hours will be 2.2 x 10^-3 count s^-1, corresponding to an observed (unabsorbed) 0.3-10 keV flux of 7.9 x 10^-14 (1.1 x 10^-13) erg cm^-2 s^-1. The results of the XRT-team automatic analysis are available at http://www.swift.ac.uk/xrt_products/00742866. We observed the field of GRB 170317A (LaPorte et al., GCN 20885) in Ks-band with a wide-field near infrared imager at Okayama Astrophysical Observatory (Japan). The imager has effective aperture of 0.91 m.
Observations started from 09:54 UT on 17th March, 8 min after the BAT trigger, to 10:38 UT. The total exposure of 17.0 min was successfully obtained. In our co-add image, we did not find any new point source within the XRT error circle (Beardmore et al., GCN 20887) down to the limiting magnitude of Ks=16.1 (Vega, S/N=5). The photometric calibration was made against 2MASS field stars. The Swift/UVOT began settled observations of the field of GRB 170317A 87 s after the BAT trigger (LaPorte et al., GCN Circ.20885). A fading source consistent with the XRT position (Beardmore et al. GCN Circ. 20887) is detected in the initial UVOT exposures. The GRB afterglow was also observed by Mazaeva et al. (GCN Circ. 20886) and Mao et al. (GCN. Circ. 20889) in the R band. Dec(J2000) = +50d 30' 00.5"
with an uncertainty of 1.0 arcmin, (radius, sys+stat, 90% containment). The partial coding was 46%. The mask-weighted light curve shows a FRED-like pulse that starts at ~T-2 s, peaks at ~ T+2 s, and ends at ~T+18 s. T90 (15-350 keV) is 11.94 +- 4.87 sec (estimated error including systematics). The time-averaged spectrum from T-0.29 to T+18.29 sec is best fit by a power law with an exponential cutoff. This fit gives a photon index 0.80 +- 0.49, and Epeak of 58.8 +- 10.5 keV (chi squared 75.18 for 56 d.o.f.). For this model the total fluence in the 15-150 keV band is 1.3 +- 0.1 x 10^-6 erg/cm2 and the 1-sec peak flux measured from T+1.28 sec in the 15-150 keV band is 3.5 +- 0.3 ph/cm2/sec. A fit to a simple power law gives a photon index of 1.78 +- 0.10 (chi squared 89.59 for 57 d.o.f.). All the quoted errors are at the 90% confidence level. We observed the field of GRB 170317A (LaPorte et al., GCNC 20885) with the optical three color (g', Rc and Ic) CCD camera attached to the MITSuME 50cm telescope of Okayama Astrophysical Observatory. The observation started on 2017-03-17 10:14:19 UT (~28 min after the burst). We detected the previously reported afterglow (LaPorte et al., GCNC 20885; Mazaeva et al., GCNC 20886) in Rc and Ic bands. 0.06138    11:14:22    6120.0     >20.5  19.3 0.2     19.2 0.3"
as calibrated against nearby PanSTARRS-1 DR1 objects. We observed the field of GRB 170317A (LaPorte et al., GCN 20885) with the Reionization and Transients Infrared Camera (RATIR; www.ratir.org) on the 1.5m Harold Johnson Telescope at the Observatorio Astron=F3mico Nacional on Sierra San Pedro M=E1rtir from 2017/03 18.13 to 2017/03 18.30 UTC (17.37 to 21.38 hours after the BAT trigger), obtaining a total of 2.84 hours exposure in the r and i bands and 1.19 hours exposure in the Z, Y, J, and H bands. We observed the field of GRB 170317A (LaPorte et al., GCN 20885) with the Reionization and Transients Infrared Camera (RATIR; www.ratir.org) on the 1.5m Harold Johnson Telescope at the Observatorio Astron=F3mico Nacional on Sierra San Pedro M=E1rtir from 2017/03 19.13 to 2017/03 19.30 UTC (41.26 to 45.37 hours after the BAT trigger), obtaining a total of 2.84 hours exposure in the r and i bands and 1.19 hours exposure in the Z, Y, J, and H bands. The source has faded by about a magnitude in r and i since our earlier observations (Watson et al., GCN 20911). At 2017-03-17 09:45:56.0 UT(T0), during a routine on-ground search of dat= a, POLAR detected GRB 170317A (Swift BAT (trigger # 742866); LaPorte et al., GCN 20885). The POLAR light curve consists of one peak with duration (T90) of 6.00 =EF= =BF=BD 1.00 s measured from T0. The 1.00 s peak flux at T0 + 5.50 s is equal to 370 =EF=BF=BD 50 counts/= sec. POLAR recorded 1500 events from the burst. Above measurements are in the energy range of about 15 - 300 keV. The analysis results presented above are preliminary. POLAR is a dedicate= d Gamma-Ray Burst polarimeter which was launched on-board the Chinese spa= ce laboratory Tiangong-2 (TG-2) on Sep 15, 2016. The energy detection range = of POLAR is ~ 50-500 keV. More information about POLAR can be found at http://polar.psi.ch/pub , http://polar.ihep.ac.cn/en/ and http://isdc.unige.ch/polar/ . The AMI Large Array robotically triggered on the Swift alert for GRB 170317A (LaPorte et al., GCN 20885) as part of the 4pisky program, and subsequent follow up observations were obtained up to 10 days post-burst. Our observations at 15 GHz on 2016 Mar 17.59, Mar 18.78, Mar 20.79 and Mar 22.78 (UT) do not reveal any radio source at the XRT location (Beardmore et al., GCN 20887), with 3sigma upper limits of 126 uJy, 246 uJy, 84 uJy and 111 uJy respectively. We observed the field of GRB 170317A (LaPorte et al., GCN 20885) with 1m telescope of Deokheung Optical Astronomy Observatory (DOAO) in Korea, starting from 2017/3/17 10:41:47 to 11:59:41.5 UT which is 0.042 days to 0.093 days after BAT trigger. .
We obtained V, R, I images and clearly detected afterglow on the stacked images (LaPorte et al., GCN 20885; Mazaeva et al., GCN20886; Xin et al., GCN 20888; Mao et al., GCN 20889; Kuroda et al., GCN20899). The photometric calibration is based on in APASS catalog in the observed field. No galactic extinction correction is applied. Photometry is based on nearby USNO-B1.0 stars previously used in GCN 20886.